Fictions play a foundational role in our society. We encounter many of these fictions as images that feel bigger than we are, juggernauts projected onto the world we inhabit: social constructions of monetary value or race, or images on television considered synonymous with reality. In Marwencol we see the process from the other end as we follow a man who chooses and controls his fictions, projecting his real-life traumas onto a 1/6 scale world as alternative therapy. On April 8, 2000 Mark Hogancamp had his memories literally beaten out of his head by five guys outside a New York bar; the film follows his life in the aftermath of the attack. After being kicked out of the hospital (he can’t afford to stay), Mark seeks out an artistic outlet to continue his therapy. The nerve damage from the attack makes his hands too shaky to continue drawing, so the local hobby shop turns him to miniatures. Mark quickly becomes absorbed in his new hobby and creates a whole town called Marwencol, populated by World War II figurines. Painting minute details helps steady his hands, and the scenarios he creates between the dolls exorcise vengeful thoughts and allay loneliness. When Mark’s photographs of Marwencol catches the eye of an art publication, an upcoming gallery exhibition of these photos becomes his newest challenge. Mark’s confessions about himself and his uses of Marwencol make the film uncomfortably intimate, but with touches of disarming charm. You’ll wince as he hugs a doll based on a girl he has a crush on, and be horrified at the violence his characters enact upon the SS soldiers who torture his personal wax avatar (a stand-in for the attack he experienced). Mark blithely confesses to enjoying the power of manipulation in Marwencol, but he’s so childlike in his earnestness that it’s hard to feel truly threatened. Contextualized by the physical and mental trauma of his attack (PTSD is quite evident), the film allows you to sympathize with Mark, not treat him like a sideshow freak. Which is a strong credit to director Jeff Malmberg. For someone so shy, Mark opens up without reserve to the audience; this seems evidence of his trust in the filmmaker, who spent four years shooting the documentary. It’s obvious that Malmberg didn’t shoot the film on 35mm, as Marwencol doesn’t display the visual slickness of major studio films, but the DVCam look fits with the film’s personal narrative and allows Mark’s quality photographs to truly pop. And let us not forget about Mark’s world. Marwencol is amazingly detailed, to the point that at times I didn’t know if I was seeing a shot of a bar in real life or the one in Marwencol – “Hogancamp’s Ruined Stocking Catfight Club ” (don’t worry, all the catfights are staged). Given Mark’s attention to detail and his skills as a photographer, it’s no wonder art galleries come calling. 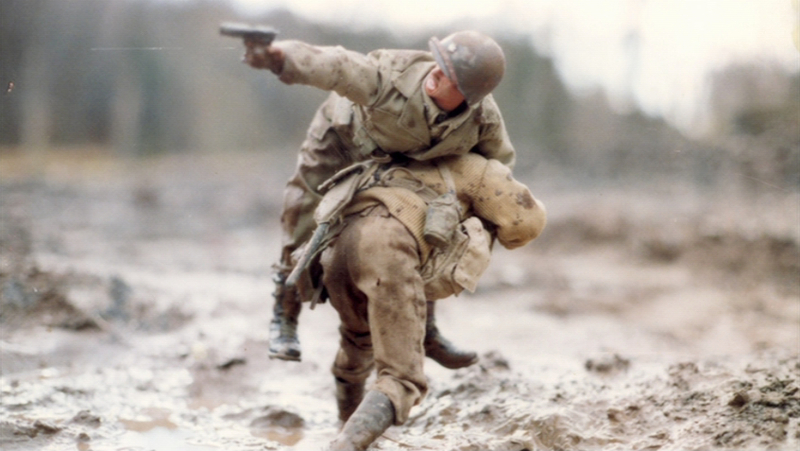 Though Mark verbally details dealing with the beating, it’s through his images of Marwencol that we get a visual understanding of his loneliness and anger. 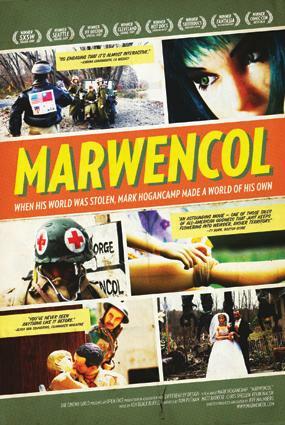 The film does seem to throw a curve ball in the last half hour to drag out its runtime, but the film is enthralling, if for nothing else the continuous discovery of Marwencol and its storylines. Despite Mark’s position as a strange, but nice guy almost beaten to death in 2000, he’s not a victim – and that might the film’s greatest triumph. Fascinating, captivating, funny, you’ve got to see this. This American Life (the tv show) did a segment a while back that featured Mark and Marwencol. Since Marwencol is in limited release, you can check out that episode of This American Life on Netflix instant streaming (Season 2, Episode 3, “Going Down in History”). This entry was posted in Filmsmith Faves, Reviews and tagged Documentary, Marwencol, Nazis, This American Life. Bookmark the permalink.